World of Final Fantasy was and still is a great journey. With its light-hearted monster collecting that evolves into an emotional big story that made me both laugh and cry, its story and gameplay is just as captivating to play years after its initial release. The game is full of many nods to the main Final Fantasy series games with its roster of familiar characters that you can now battle as in the new Maxima edition, on top of its interesting original mechanics like its size and stacking ones that are fun to play with all together, even if the frame rate wasn’t always perfect outside of docked mode. Years later, World of Final Fantasy in its updated Maxima form is still a story worth experiencing for fans of Final Fantasy who don’t mind a light-hearted story and for those who like the idea of exploring its unique, fun take on the Final Fantasy universe that now has even more to offer. The story of World of Final Fantasy revolves around its own protagonists Reynn and Lann, two twins who discover something is amiss when they awaken in the town of Nine Wood Hills to discover an empty town and their memories blurry. They’re greeted by the adorable Tama and mysterious Enna Kros who explains that they used to command a legion of monsters called Mirages before an incident occured that left them without their memories of using them and no knowledge of how they lost them. After being led to a gateway to the other world called Grymoire, Enna Kros suggests that if they find mirages they’re likely to remember everything, so they set off into the world inspired by many Final Fantasy games to collect mirages and find out what happened. I adored this story the first time I played it on PS Vita thanks to the charm of its characters and humour mixed in to so many aspects of its world while still balancing a deep and emotional story. These kinds of spin-offs games featuring throwbacks to old characters always have the risk of being cheesy, but World of Final Fantasy gives each character a role that made everyone feel like they had a purpose outside of their humourous moments. 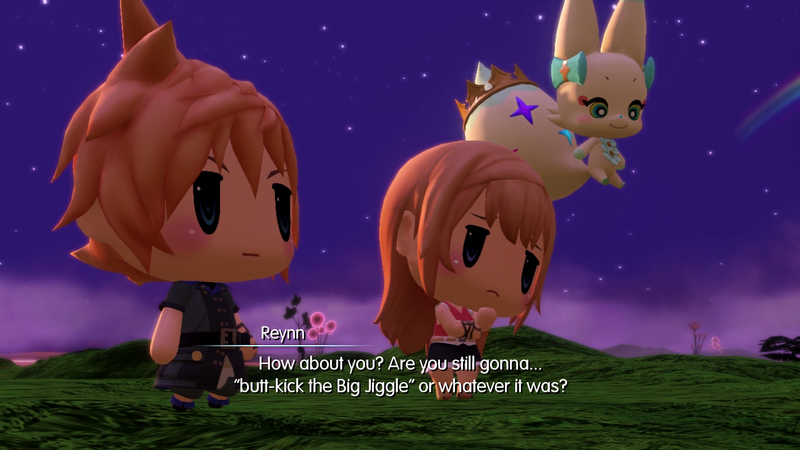 World of Final Fantasy’s nostalgic chibi world still is a joy to experience thanks to its mix of familiarity with its smart plot twists and original cast of characters that provide continuous witty banter and despite having played it before, the story still had me emotional when it should, especially towards its great twists towards the end of the story. While there’s a lot of great new content to find in Maxima, the original story is still worth experiencing if you’re looking for a good balance of fun and serious in a story and whether you’re familiar with all of the Final Fantasy characters featured or just some of them like I am, if you like the idea of discovering them through humour while searching the world for the twins memories, there’s a good story journey to be had between mirage collecting in this game. If the nostalgia from its Final Fantasy characters wasn’t enough, there are the many familiar looking Mirages to capture around Grymoire that include the famous Final Fantasy enemies everyone knows and loves, but in World of Final Fantasy’s adorable chibi style. This all goes hand-in-hand with its stacking system - you capture mirages and depending on their size, Reynn and Lann can either put them on their head if they’re a smaller mirage like a Moogle or ride on them if they’re bigger mirage like a Behemoth and all characters stats combine to creature a powerful unit, with extra abilities given if you make a stack full of fire mirages or with matching abilities. It’s a unique system with an equally unique look and I still enjoy how fun it is to try and find mirages that pair well together, along with ones that benefited me traveling through its world, with some able to melt ice or fly you over high areas. It puts a little more thought into just catching monsters since you have to consider their sizes, field abilities and how they’ll pair together, especially considering a stack of randomly placed mirages can even be knocked down and separated by enemies too if they don’t balance well, so it was fun to try make these all work together when creating a strategy for traversing certain areas and battling as well. Additionally, each mirage has their own skill tree in one of my favourite parts of monster development in World of Final Fantasy. 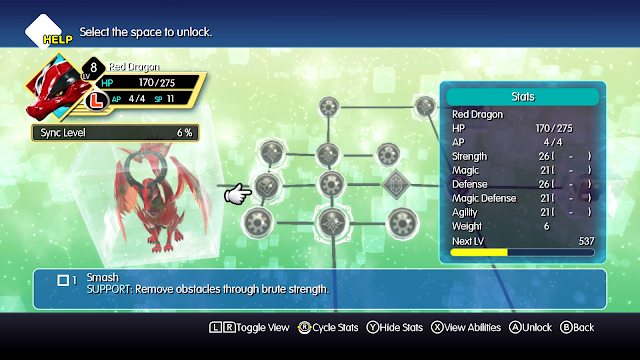 As you unlock nodes in their skill trees, you can give your mirages new skills, get bonuses for unlocking a certain percentage of nodes and also unlock different transfigurations of some mirages, including ones that are essentially evolutions into larger versions, such as a Chocochick turning into a proper Chocobo. As a fan of skill trees, having one for each of the over 200 mirages in Maxima made me feel like developing each one was its own experience and I loved completing one mirage board to find I could keep growing it in an alternative version of it until I mastered all of that mirages boards completely. 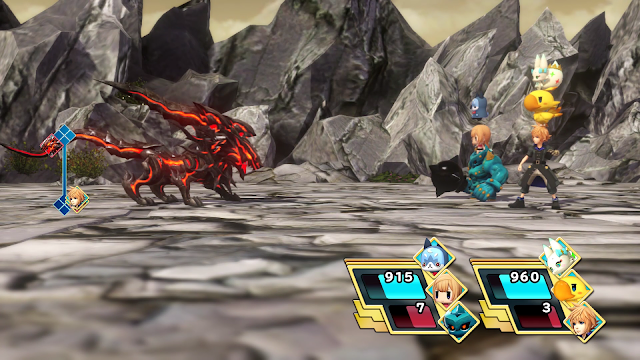 These kind of party and character development aspects make World of Final Fantasy feel both like a monster collecting game, but also a deep character developing one too and being able to develop them into a stronger form while also leveling them up means that you can get a lot of power out most mirages and while some are better than others, this system makes most mirages viable enough in battle as long as you put the work into developing them. I’ve talked a lot about the mirages, but it was also nice to remember the great active time battle system at the core of everything this is still one of my favourite to play thanks to its time-respecting nature. It features a timeline where you can see when you and the enemies will attack, allowing you to plan turns accordingly and also use tricks like defending to build up your ability points while also attacking half a turn later rather than a whole one. What I also love is how you can fast-forward between the event-less time between turns. Since the timer shows you the speed of how attacks are moving, you can fast forward that time in between while still keeping track of how your attacks are moving compared to the enemies, which is valuable when you notice an extra turn coming up before a boss does its big attack so you can prepare or brace yourself if you won’t get another. 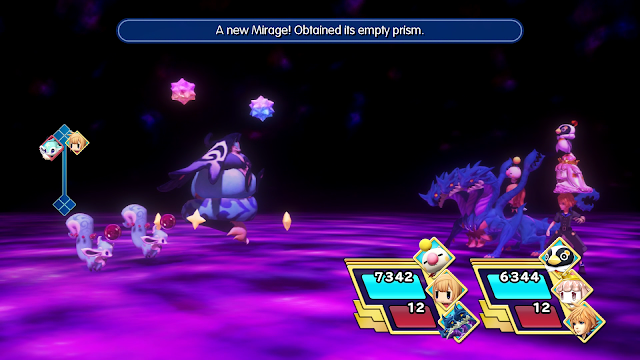 While it meant I was speeding through a lot of the battles, World of Final Fantasy has a lot of very theatrical special attacks for champions, Final Fantasy heroes who can be summoned, and boss attacks I’ve seen many times before and are shown a lot during battles with them, so skipping all of that is a good time saver and keeps battles more focused on actually strategizing and playing rather than watching the same animation over and over again to kept things constantly engaging. World of Final Fantasy in its Maxima edition is its first time on the Nintendo Switch and Xbox One and it’s a little more than just a port of the original game as it features new mirages and systems, a new mini-game, a secret ending and more. 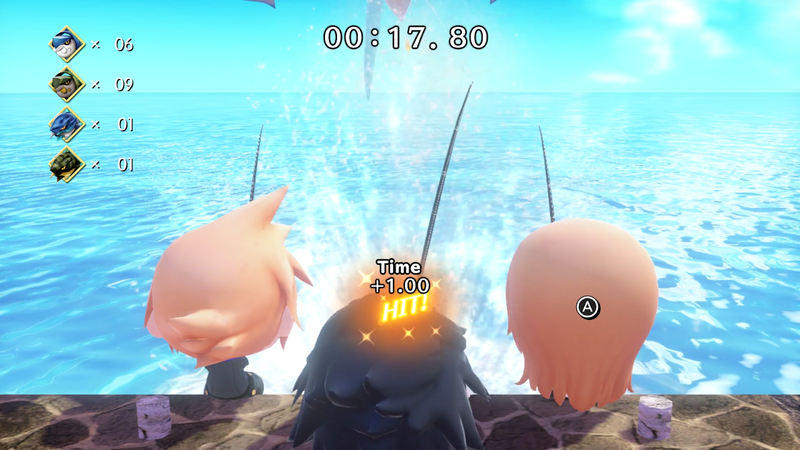 World of Final Fantasy has plenty of content itself as replaying the full story with the original true ending took me about 30 hours and had a bunch of extra mirage collecting and quest-doing that could’ve easily brought that experience beyond 50 hours, and the Maxima content can make that even longer. The new content is mostly optional, sometimes hard to find and available towards the end game, although a few systems such as the Avatar Change one which lets you change chibi Reynn or Lann into one of the Final Fantasy characters featured can be used fairly early on and provides some great extra abilities to use in battle and was a cool new element to play with as someone who has played the original. While I still have plenty more new Maxima things to find and try, I did enjoy certain new additions like the addictive Noctis fishing mini-game and finding where the new mirages were hiding and even though I was happy to have an excuse to play this great game again in general, the extras added in Maxima have given me more than enough to go back in again when I need another excuse to play. While having World of Final Fantasy on a bigger screen both in handheld mode and in docked is better than the experience I had playing on Vita, there are a few minor issues with the visuals that I noticed from time to time. Playing docked seemed to give me the smoothest experience, with the only issue being that some of the pre-rendered cutscenes such as the game’s opening video don’t seem to have been fully upgraded to look its best in 1080p (it looks fine in docked though), but since most of the cutscenes seem to be in-game cutscenes that look as they should, docked was the nicest way to play in general. Undocked is mostly fine to play as well and the resolution is more consistent in terms of cutscenes, although I did notice a few more frame rate issues initially, however it strangely seemed to be less of a problem towards the end of the game, so either I got used to it or it only happened in some of the mid-game areas. In any case, both methods were enjoyable enough to play on the go and at home considering I was just happy to be using the Switch’s bigger display either way and I was also pleased to see that the issues I had with long load times with the Vita version a couple of years ago were pretty much non-existent and made the experience feel smoother anyway, so as long constantly perfect frame rate and resolution aren’t that big of an issue to you, it looks and feels good to play both ways on Switch. World of Final Fantasy is absolutely still worth playing thanks to its great story and take on the Final Fantasy series and its characters, and Maxima’s additions make buying it an even better deal thanks to the sheer amount of content in it. There were so many things I enjoyed rediscovering in its world - its great active time battle system still keeps battles quick and engaging, its amusing group of characters are still funny, its skill trees and mirage development systems are still deep and enjoyable to play with, on top of new things I love like fishing with Noctis. Even years later, World of Final Fantasy is still one of my favourite games thanks to how well it presents everything in it, especially in this content rich Maxima edition, and like other games Square Enix has rebooted recently, this game has reminded me how much I would like to see a sequel for this game in the near future thanks to how much fun I had playing with mirages in its world. PS. Tama is still everything. You can pick up World of Final Fantasy Maxima for Xbox One on Amazon! Have you played World of Final Fantasy or the Maxima version? If you have, what did you think of it?